I'm not responsible for any damage caused to your Android device or DJI equipment. You are accepting the risk of running modified software. Any software downloaded and installed outside of the Play Store may contain viruses or malware. I have taken as many precautions before offering this modded software, but there's always a chance of failure when not directly downloading from the Play Store. This MOD may contain tweaks that are illegal in your country. Due to EIRP laws that change depending on where you live, you might be running the risk of altering your devices WLAN transmission power to the FCC limits. Please check in with the EIRP WLAN laws related to the country you will be flying in. All Copyright and Images are property of DJI. 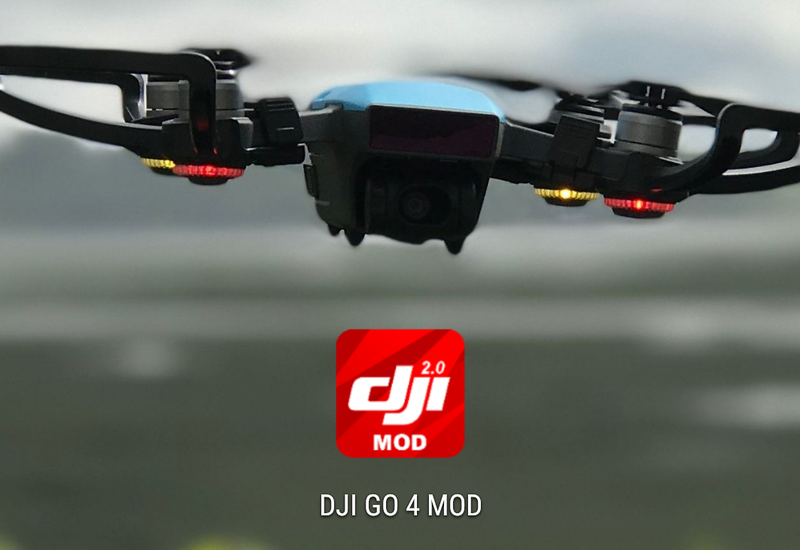 This is a fan made mod to enable additional features not accessible in the original DJI GO 4 application. If you have tested this mod on your device, please reply if it's working, as well as what device you are using, and I will add your device to the list. Great idea! Will give it a shot. Oops, I have premium, so let me re-clone. I cloned when it was still the free app. I'd thought of doing that but hadn't gotten around to it yet since I use my iPad 2017 for "official" flying. Are you saying the modded version is 4.1.15 ? I thought versions after 4.1.9 couldn't be modded ? Updated the app with the pro version of App Cloner. This is a bad move.. also one not recommended by the guys who have patched the app and put all the hard work in. See GitHub - Bin4ry/deejayeye-modder for more info. DJI have implemented root and hack detection into the stock app.. im not saying it will happen but there is nothing stopping DJI bricking your spark if they detect the modded app. The Readme over there confirms that 4.1.15 is moddable, a special version though. Nothing stopping them? What about losing costumers after refunding a perfect working Drone. They can't brick it, but they can save data saying you used a 3rd party system though and void warranties and any other service outside the basics of flying I'd bet. This is why I run the modified and official app on a dark phone. One that doesn't have a Sim and the only WiFi network saved is my spark controllers. They can't brick what they don't know is unofficial. It seems many of the mods implimented in the GitHub avoid calling back home unless you want to sync your account (which I did when setting up the account for flight records). You can either login with your real account (online) or use the fake accout. To use the fake account you have to go offline (airplane mode) and put any non-numeric characters in the login box. On 4.1.8 you will need to stay online for the initial obb Download! This is needed once on first start! This patch is automatically applied with "remove Onlinefunction". Will patch the libSDKRelativeJNI.so to stop it from calling home!" I didn't know there was a GitHub where you can patch the app yourself. If anyone wants specific mods enabled or not enabled let me know and I can set up these on a Linux box and compile a new mod. When i switched from this modded app to official app on IPad it gave me some massage that i was flying in a different country and could not get an image for a couple of seconds. I closed the app an restarted and then everything was fine again. Im novice in this stuff but i guess some things were switched by the modded app, is that correct? It might have logged the flights to the drone, then when you launched the official app it noticed there were new flights logged, and thought you flew it in another country. The Sony Z3 looks like it had a lot of development on XDA, I would check that out and see if you can get Lineage OS 14.1 up on it if it starts up again. The Mi A1 looks incredible for the bang for buck with a clean android experience as well as an oreo update. I don't think you can go wrong with that phone.